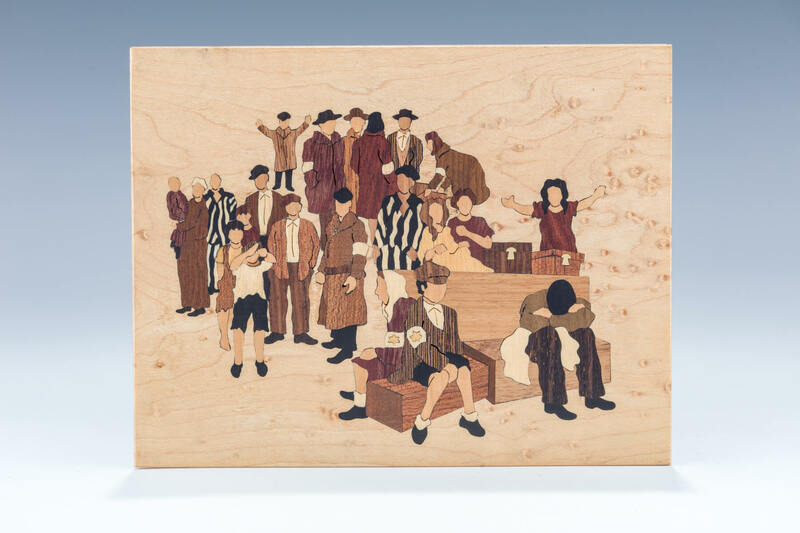 Brooklyn, New York: “Waiting for an uncertain destination”, Artist’s collection The inlaid scene depicts the tragic wait, Jews sitting on their valises during the Shoah. The despair of the characters depicted in the artwork clearly conveys the pathetic hopelessness of the moment. Made of hand cut tiny woods, the main background is Bird’s Eye Maple. It is important to note that special to this particular piece and unlike all of their other works the artists have left the back of the panel visible allowing the viewer to see the detailed inlaid work from the front and from the back. 6.4” x 5.1”.